Please refer to our stock # MB069 when inquiring. This large and attractive blue & white porcelain dish was made during the Kangxi reign (1662 - 1722) of the Qing Dynasty. It is relatively "heavily-potted" and has a pleasing curved wall. The inner surface has been lightly carved with an elaborate lotus bud pattern. 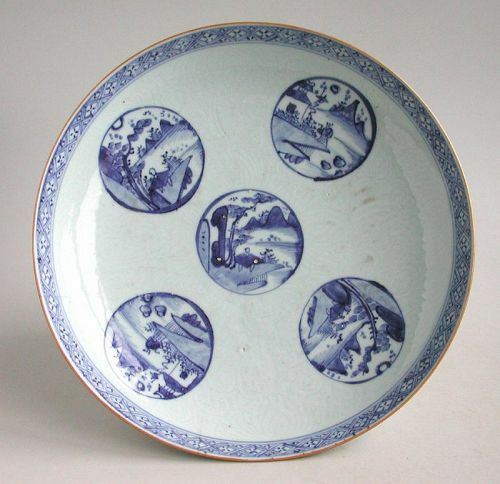 The underglaze blue decoration features five roundels within which are pagoda and riverside scenes. Around the inner rim is a wide trellis border. The rim edge has been painted in iron-brown to prevent fritting of the glaze during firing. The underside remains undecorated. Diameter 27.5 cm (10.75 inches). There is minor surface wear to the glaze and two stained hairlines to the rim edge that could possibly be cleaned. There is no repair or restoration.